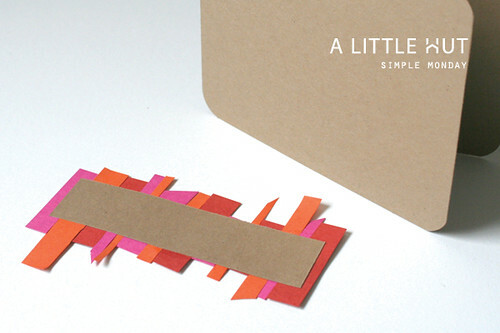 Here's a very simple card idea of how you can used the scraps project I posted a Saturday. Simple is easy, quick and gives great results. 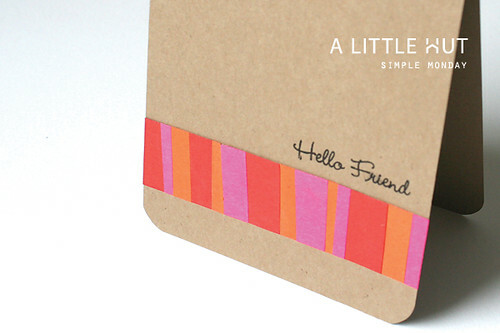 I simply used scraps, a Crop-A-Dile Corner Chomper tool , basic kraft card stock and a glue stick—that's it! This idea can be used for so many other simple projects—embellishing a gift tag, for a scrapbooking layout, and as a gift topper—I'll show you that tomorrow. I forgot to mention that you don't even need to worry about making the strips completely straight or at 90-degree angle to the bottom of strip that I added the scraps to—a little slant gives the pattern some personality. By the way, I know many people use tape gliders but for whatever reason those things have never worked for me. They unravel like old-fashioned cassette tapes and end up frustrating me more than anything else. The highlight of my weekend was helping my little C make her first scrapbook (I don't have a better photo because she wanted to take it to school to show it off- ha!). It was a simple project but I loved helping her. As a paper crafter I was thrilled, as a mom I was completely ecstatic! I love seeing her craftiness starting to bloom. I love what I do but I never push it on the kids. I want them to take on their interests, whatever the may be, naturally. "D doesn't know what he's missing! This is SO MUCH FUN!" Now to tackle the good ol' to-do list for the week. Happy Monday!